Giant Map Roll Out at the The Cradle of Aviation, Nassau County, N.Y. 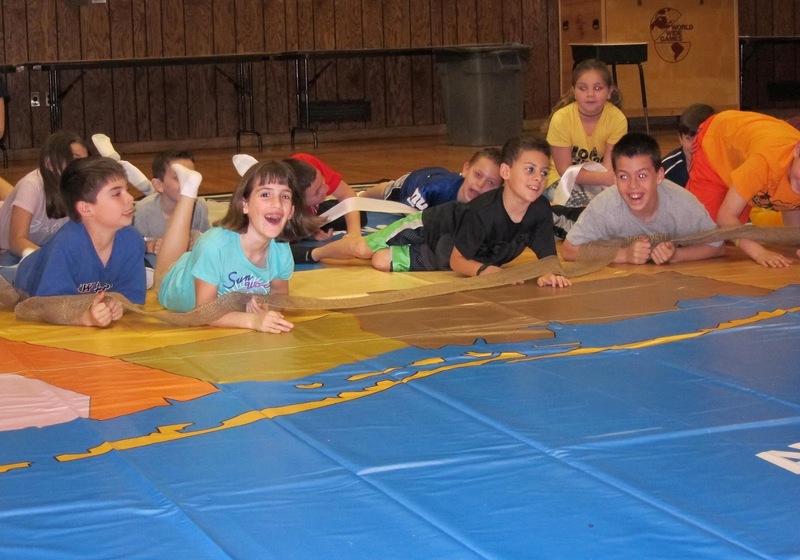 Imagine a gym-floor sized map of Long Island coming to your school! 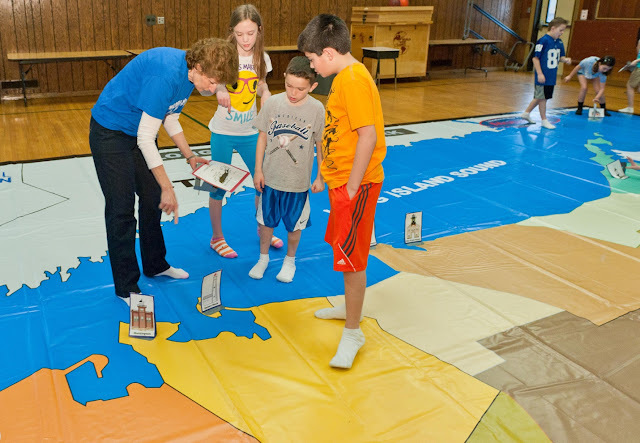 This great teaching aid was fashioned after National Geographic’s Giant Travelling Maps program and designed in partnership with Mapzzles.com through a generous grant from the Nassau BOCES Foundation. 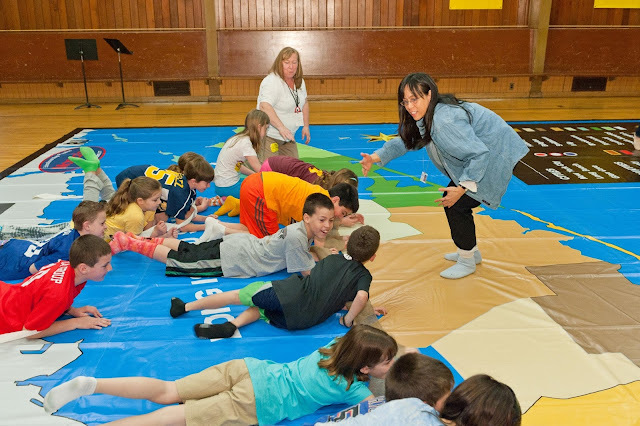 We’ve designed lots of “hands-on” and “feet-on” activities to help students practice map reading skills, scale and understand geography concepts. Two of our naturalists facilitate the program. Specific to the Long Island theme, activities address glacial formation of LI, native groups, “wreck valley” and local sites and landmarks and transportation. How can citizens evaluate US foreign policy options if they know nothing about the countries involved? Geography is included among core subjects in the Federal Goals 2000 Legislation to improve U.S. education. As a result of this initiative and others, National Geography Standards have been developed and are being distributed around the country. These geography standards are benchmarks against which the content of geography courses can be measured. They will affect the education of all children in the United States. How can we assess the merits of the North American Free Trade Agreement if we are unfamiliar with current U.S. trade patterns with Canada and Mexico? How do we know if U.S. troops should be sent to places such as Bosnia-Herzegovina or Haiti if we are ignorant of the land and people with whom they must deal? How can we develop opinions on such matters as conserving the Pacific Northwest, limiting development of Mississippi River flood plains, or spending billions of dollars to clean up toxic waste dumps if we lack the basic knowledge of geography that is required to understand the issues that are involved? Concern over the lack of geographical knowledge in the United States has been expressed by local, state and national governments. This is primarily directed to teachers, parents or caregivers whose job it is to understand the benefit of and appropriateness of puzzles. 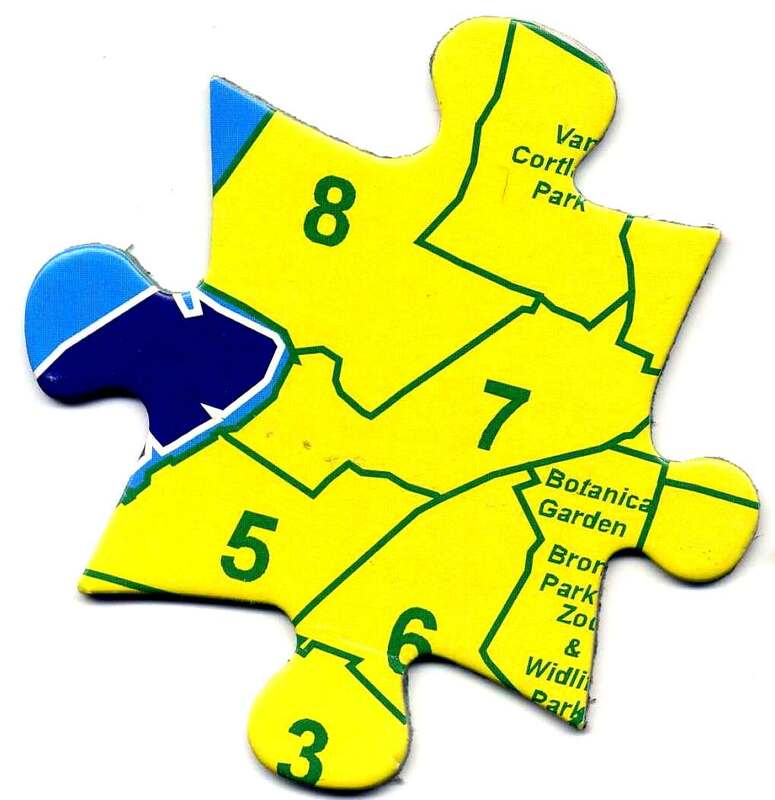 Puzzles of 100 pieces are appropriate for primary school students (6-8 years of age) and for physically and developmentally challenged children and adults. Concepts and skills falling within guidelines recommended for choosing puzzles for this demographic are: reading, observation, critical thinking, long-term projects. Provide a space free from clutter and accessible to all. There are two directions here for the role of facilitator, i.e. to make suggestions and offer teaching strategies. Children naturally gravitate to puzzles. Dumping them and putting them back together is in itself a learning process for children. Reluctant puzzlers lack focus and skill. They need many successful experiences with teaching strategies that will make problem solving easier. Always praise children for their involvement and effort in trying a new puzzle. Involvement and effort thrive on praise for "doing it all by yourself" and finishing a puzzle "cooperatively with a friend." Solitary play (playing alone) is a quiet activity. It offers needed respite from negotiating with others. Children’s solitary play with puzzles is learning in itself. A self-imposed time out. It also occurs in parallel play and group play. Parallel play: Engagement with the same activity, materials, or in the same vicinity – with no interaction with others. Children accomplish something independently while also in the company of others around them. Move children from parallel play to group play. Encourage them by sitting with 2 or 3 kids and guiding them through puzzle completion. Ask a child that is proficient to help (not take over). Encourage taking turns. Group Play: Associative or Cooperative. Share and coordinate materials and space but not actually cooperate (hand a piece that’s too far away to reach – this is the bridge (transition) between parallel play and true cooperation. Cooperative group play, usually seen in children 4 yrs and older, involves children really playing together and usually includes a lot of talking and sophisticated negotiations. It is appropriate to request or offer assistance at this age. Label Puzzles: Label the back of each puzzle piece so that puzzles can be easily identified. Labeled puzzles are a great time saver. (Letter or Number) (when mixing one or more puzzles in the same container). Problem Solving: A problem is any situation in which the child does not readily see a solution or strategy for tacking the problem. With effective problem-solving skills, children learn how to attack a new situation. Problem solving is not only a key factor in completing puzzles, but a life skill that each child needs. It’s essential that children continue to develop effective problem-solving strategies as they go through life. Mapzzles® are a perfect medium to practice at this age since each puzzle can be directed toward solving a different problem. As children practice, slowly and gently remove your support, letting the children take responsibility for the process themselves. Discuss strategies, colors, vocabulary, scene, border pieces. Remove pieces one at a time, set them face up. Talk your way through placing each piece in the puzzle. Play a game with kids, "Looking for a piece that...yes, that’s right! This piece fits because..."
● Talk with children about a particular puzzle before taking it apart. ● Actually demonstrate for children how to take the puzzle pieces out one at a time. Look at each piece individually. "Flip and dump" should be a last resort. ● Show how to turn all pieces face up before beginning so they can see each piece. Logical piece puzzles – look at each one and discuss its relationship to the whole. ● Border or frame – look at nearby colors – straight side pieces or round corners. Build a border all the way around before filling in. ● Look at empty space – guess what shape matches. ● Encourage child to turn piece until it fits. If difficulty continues, put puzzle piece beside the space, turned in right direction, so child can see how it fits. Encourage child to twist and turn piece gently instead of trying to force a piece in. 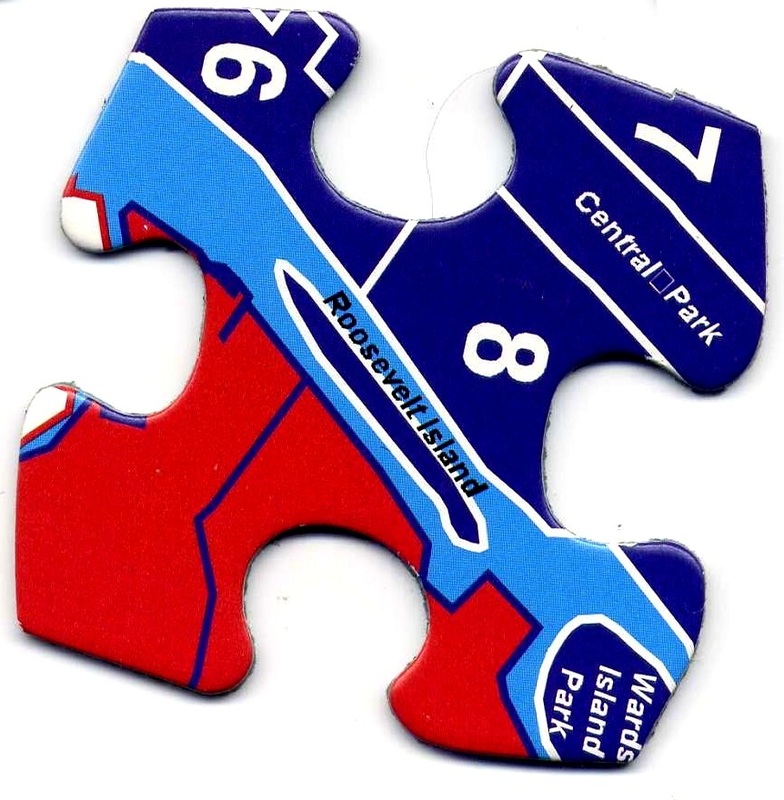 ● Move next piece close to child’s hand or touch the next puzzle piece to draw attention to it. Tell child next piece is one of three pieces. ● Tap the appropriate space. ● Always remember to acknowledge a child’s ability to place the puzzle pieces independently as well as complete the puzzle. Children and puzzles are a perfect fit. For young children, playing is learning. Watch children working with puzzles. You can see the wheels turning in their heads as they figure out color, shape, form and consistency. Expand beyond solitary play. Fearon Teacher Aids, A Division of Frank Schaffer Publications, Inc. If members of your family travel or if relatives live in distant places, have your children look up the places to be visited or where the relatives live and get information about them. If your family takes vacation trips, obtain a road map or highway atlas and have your children help plan the trip. If it is convenient, let your child choose the vacation destination or select among the possible routes. Ask your children to figure out how far you should travel each day, where the best stopping places would be, what points of interest might be found along the way (and some background about them). Will you pass across a time zone boundary on the trip? How will the time change and why? If you are going to a special place such as a zoo, museum, or amusement park, let your children plan the route there on a street or road map. Play geographical games. Many "geographical" board games are available for children and families. If you are so inclined, playing these games with your children may help them to learn isolated facts and locations. However, commercial games are not necessary for learning geography. Spending fifteen minutes or a half an hour a day or every other day asking questions from an atlas or wall map or taking turns with the children asking questions of the adult will probably be more effective in the long run as a learning strategy. For younger children, map puzzles of the United States are a good tool for beginning to learn the shapes and relative positions of the states. What do you want to be? It must be one of the most universal questions asked of children. The question intensifies as the teenage years arrive and gets even hotter as we find ourselves at a position when something should have been done and we need to be on the road to somewhere. I remember a commercial that talked about career opportunities. It started off with a lot of children discussing their career aspirations. "I want to be middle management," "I want to be a temp secretary," "I want to be on a weekly wage always struggling." The advertisement played on the fact that, that is not what anyone would aspire to. Yet so many people end up in these situations, seeking out a life for themselves. So what is it that we teach our children? Ezra Taft Benson was once quoted as saying "Our young people need love and attention, not indulgence. They need empathy and understanding, not indifference, from mothers and fathers." He said "Praise your children more than you correct them. My plea... is a plea to save the children." The worldly success of a good job, education, being a contributor to society starts with a well balanced individual. It is difficult to piece together life’s puzzle. The jigsaw pieces don’t always fit in the way we think they should. However, if children are taught with love, the question "What do you want to be?" becomes even less important than the question "Who do I want to become?" The answer to that question may well be someone that's able to look at the jigsaw puzzle pieces and know where to begin -- even when there is no picture on the box.